It's been a while since I last did a label feature, but recently I've been contacted by a few asking if I'd like to review some of their releases. So many in fact that I'd do a series of special features. 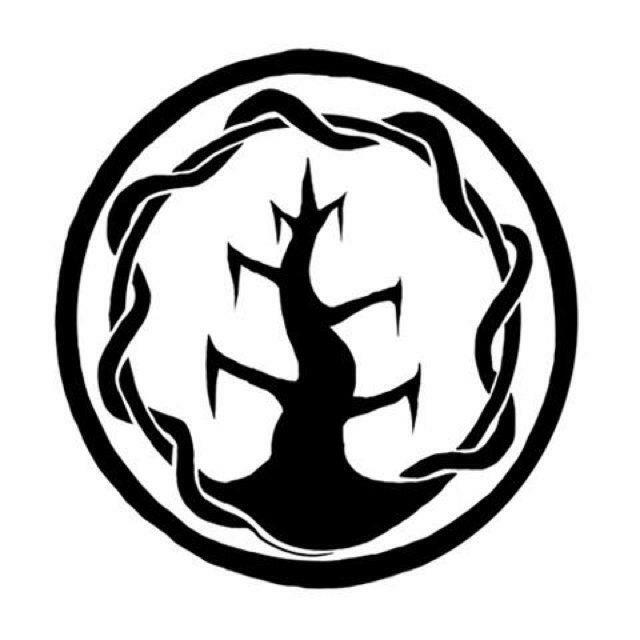 I'm starting it with Broken Limbs Records, a label that a based in both New York City and the West of Ireland. BLR has been featured here before, when I reviewed the tape reissue of Unsacred's EP Three Sisters, which was released by Invektiv Records, though originally released on CD by this very label. As with many of the labels I've come across in recent months, head honcho Peadar is a huge fan of analogue formats like vinyl and cassette and as well as running a cool, underground label also used to be an admin for a Facebook called Metal on Cassette and has since branched off on his own with a page called Summoning Spirits, which aims to share and chat about all manor of analogue releases from metal and beyond. So anyway, back to the task in hand. I've selected a few releases from random, some that have been submitted to me and some that haven't, which I'm going to review to hpefully help spread the word about BLR and the bands they've worked with. These bands cross over many sub-genres, including black metal, folk metal, crust and ambient noise, so there should be something here for every extreme metal fan. So, sit back and enjoy! Oak Pantheon are a duo from Minneapolis, who released their debut album through BLR in September 2012. It was released as a limited CD which has long since sold out. They have been gaining new fans at a pretty fast rate since it's release last September and while quiet now, they are still well worth investing you time into. Whenever I listen to duos, I'm always in awe of the noise they make. Oak Pantheon just adds to that notion. Descend Into Winter, which contains a great instrumental build up sounds really clear and concise. The mixture of cleanly sung post-metal vocals and the more blackened screams stop the music from being pigeonholed and the melody shows that there are hooks to be heard and that crescendo of an ending makes this one hell of an opener. The bells that punctuate the guitar at the start give it a haunting almost gothic feel. The soundscape created is icy cold, with the quiet whispered vocals making it even colder. The riffs that sit underneath the growls are hypnotic, as are the drums. We Will Tear Down The Gods changes the mood with some really nice acoustic/folk inspired guitar. The singing conjures up mystical images in my head, before the more reigned-in growl is heard. It ends with the sound of a running stream and calm acoustic guitar, which builds in intensity before an almost symphonic section closes things. It's actually a surprisingly upbeat ending to the song. Listening to Aspen and I hear subtle thrash-metal textures during the riffs. The majority of the song though is resplendent in Oak Pantheon's signature soundscape. I'm one of those people who like the more ambient/grand side of black metal; listening to this is a treat. The more post-metal elements really make From A Whisper a truly listenable opus. Where Oak Pantheon does succeed is in their song-lengths. It never seems like they've ended a song for the sake of it. They let them reach their logical conclusion and keep the record flowing as one whole. The halfway point comes and goes to reveal the acoustic beauty of The Ground Beneath You. It again underlines Oak Pantheon’s preference to let their instruments and their musical skill do the talking, instead of injecting some pointless gimmick into the album. It's an instrumental piece that you could truly get lost in. Roots of Man follows in the same vein and soars to a majestic end with some great lead work. Much like the rest of the album so far, it follows on in a way that shows that Oak Pantheon have put considerable thought into their song placing and structure. It's great when you listen to an album and the order makes it sound like a band is trying to tell a story through the music. 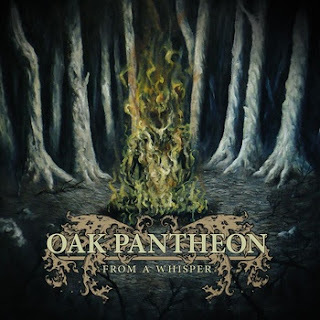 The title track is the most majestic of them all, both in length and in instrumentation, which underlines how good Oak Pantheon are. Just listen to the lead work throughout the song to see what I mean! As a song, it actually passes quite quickly and flows with subtler acoustic guitar, into final hymn Altar of Limbs. It's got more of a metal edge to it this time, during the heavier sections, relying less on the quieter more introspective elements and more on black metal. There's more buzzsaw riffing and chaotic drumming here, but it seems to be reigned in and doesn't spoil the aesthetic of the album. It's this control, which singles From A Whisper out as a genuinely immersive record. If you're a lover of finer music, which is full of great musicianship and ideas then Oak Pantheon are a band you should be checking out. The next release I'm chosing to explore is the split tape from Texan blackened crust duo Cara Neir and their New Hampshire brethren Ramlord. This four track tape was released in June 2012.Here, Cara Neir contribute three tracks and Ramlord add one lengthy track. Cara Neir certainly do open up with a crusty, blackened stench. Their brand of black metal is raspier and certainly more hellish, probably more akin to Watain than some of their more ambient peers. That being said, they do inject ambient, introspective passages into split opener Family Dirge, thanks to some clean guitar. It's a great opener, as its short and sharp but provide a great insight into what's to come from their other two songs. Cradled By Apathy features furious guitar, as well as some startling feedback at times. The drums pound away in the background and sound really organic, thanks to the recording and production. They flit between slow and fast passages, with raging vocals steering the song forward. Again, there's some really good lead guitar work, providing melody. With the longer length of this song, Cara Neir pursue more texture and ideas, as well as letting the song flow more. It certainly gives the listener more to grasp onto. With Wilted Blue, they include some great off-kilter drumming in the intro. The bass provides some crunch, which is set against the melody of the guitar. For a duo they again sound louder than they should and the production does a good job of bringing out some of the subtleties in their music. The low growls also are pretty menacing, as it's the first time you really hear them, as opposed to higher screams, which are more prevalent. Ramlord offer up one lengthy track of bass heavy, winding metal. Again it's on the crusty side, but is also sludgier. Their rumbling sound shakes your eardrums at high volume. After the initial build up though things start to speed up, thanks to some epic drumming and razor-sharp riffs. When the vocals kick in they are low growls more akin to grind vocals. There are two vocalists, much like there were in Cara Neir. Ramlord though, to my ears anyway, sound heavier. Ramlord are pretty enthralling, but in a different way to Cara Neir. They do have black metal influences within the music, but due to the slower/dirtier pace of it, it takes you longer to spot it. However, by paying that attention, you get a lot out of it. Some people though may find ten minutes too much to take, but I say to hell with them. The song balances out Cara Neir's side well and provides fans with the chance to check out a different band, which they might not have heard. It's another cool split tape, which help BLR carry their ethos of releasing nice analogue records. It also throws light over another two great additions to the wider US black metal scene. You can purchase a physical copy of the tape from the above bandcamp page too. Onto another BLR tape release and this time it's the three track EP from Colorado black metal band Deafest. This was released in July 2011 and was limited to 50 copies. After a couple of line-up changes, Deafest decided to head down the instrumental route and their main influence is the countryside around them. You just have to look at the artwork above to realise the bleakness at which they take their ideas. I've found myself listening to more instrumental black metal over the last year as well. It's been mainly ambient and has always been something I go back to when I've exhausted my ability to listen to extreme metal. 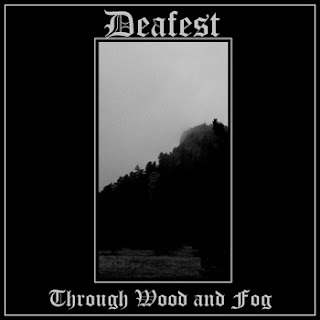 Deafest however play extreme metal, just without vocals. They make a very different sound. It's very guitar driven, but instead of thrashing them to within an inch of their lives, they play more drawn out riffs and let subtle melody infiltrate their music. The drums in the background on Fog Rolls Down The Slopes sound huge as well, but then they have to when they're competing against the guitars. The great thing about instrumental music is that it allows you to use your imagination more. The music really lends itself to that imagination as well. You can imagine the cold clouds rolling in over mountains and the rain running off fields into swollen rivers. Over The Ridge has that feeling of the frontier too it. The melody at the start sounds quite upbeat, even when it's amplified. That transition they make back into slower territory though brings the mood right back down. At times there is a more metallic edge to the song too. They carry their momentum through to last track Rock Spires Above The Trees. It's the longest song on the EP, but as a result is also the most inspiring and strangely, uplifting too. I love the melody and ambience of this release, as it breaks up the distorted low end very well. The quieter moments let you breathe and relax, in case it becomes too much for you. It's a hell of journey this one, taking you through low valleys and lifting above soaring hills and it changes pace and mood effortlessly. You can also pick up copies of the tape from the above bandcamp page. The final review I'm doing in this feature focuses on Hunter's Ground and their recent record, No God But The Wild. This was BLR's most recent release, coming in October 2012. This intial run of CD's that were pressed by BLR have long since sold out, but there is a full pressing on the way. Hunter's Ground are from the Appalachian region in the US, so expect cold, harsh black metal. As I can to the end of my first label feature, I feel that my eyes have been opened to the sheer breadth and variation that exists within black metal. All the bands I've reviewed sound different and Hunter's Ground are no exception. Their brand of black metal is probably the evilest I've heard recently. They have that trebly guitar sound that you tend to associate with black metal, the pounding drums and the raspy screams. A Storm of Crows is a great into to this trio. The vocals are slightly lower on Their Hands Were Stained With Her Dripping Blood, which give the song that extra sinister bite. It's more mid paced than the opener and Hunter's Ground settle into a bit of a groove during the gaps between verses. As And Fed Their Flesh...rings out, there's no escaping this bands torturous sound. It's almost bilious yet still restrained. The production on this record makes sure that the music doesn't sound too polished, giving a more live feel, which is always good. I think polished production jobs can sometimes make albums sound quieter and sterile, but it not the case here. Speaking In The Tongues of Trees is an instrumental piece, which features almost choral singing, sitting atop of droning guitar driven riffs. There's echo effects thrown in to the mix as well and it's a welcome excursion from HG's blackened nightmare. They inject a lot of good musical variation as well, like subtle "rock and roll" influences (though these are few and far between). They are certainly very adept black metal musicians. They do abandon some of their black metal sensibilities though during the second half of No God But The Wild. The title tracks features more singing as well as some post-metal soundscapes. These passages fit really well into the album, especially during longer songs. As No God But The Wild rages to a close, you're left with one last brief moment of silence before The Fireless Winter hails the closing of the record. Another song that flits between mid-paced passages and fast black metal, where the guitars are once again king. It’s the song where those choral elements are at their most haunting. 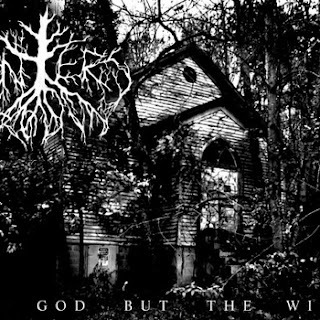 No God But The Wild is another example of the non-pretentious black metal that's coming out of the US at the moment. Hunter's Ground is another band to keep an eye on too. I do have some more releases from BLR to review, but they will come at a later date. I thought I would give you time to appreciate the bands featured here and to allow you time to investigate Broken Limbs Recordings for yourselves.